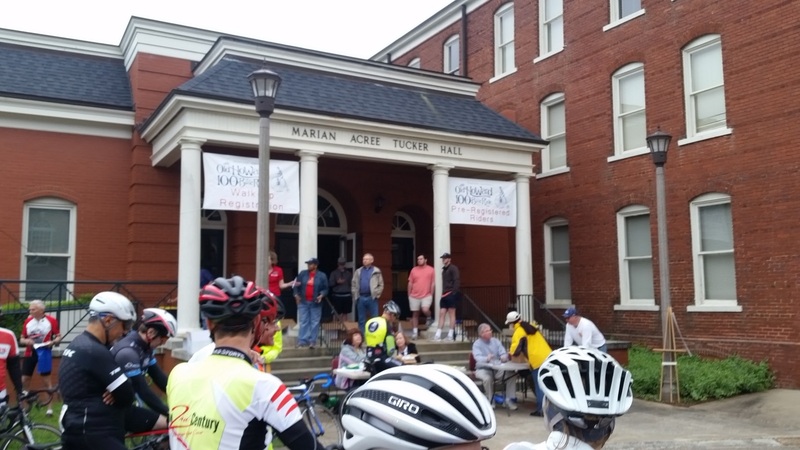 Listening to introductions from Samford University’s Rosemary Fisk before the start of the 12th annual Old Howard Century on the campus of Judson College nearby Samford’s original location in Marion, Alabama. “Let’s meet at the I-65 bridge at 3:15AM.” Sounds to me like planning a meeting with the mafia, but no, it’s just coordinating a 90 mile ride from Hoover to Marion, Alabama to make it to the start of the Old Howard Century on time. I rolled onto the I-65 bridge at 3:15 just as Jason was coming up the hill to the bridge, and together we headed up into Bluff Park to meet Michael Staley near his house off of Shades Crest. It was a bit chilly in the low 50s with intermittent light rain, and I joked how last year Michael and I had ridden for quite some time in the rain all the way down to Marion where it stopped raining before the century started. Everyone else got to enjoy beautiful weather, but the two of us were soaked and muddy! I joked about it because the weather forecast didn’t call for rain at all, so I imagined that we would just have light sprinkles every now and then but nothing steady. It didn’t rain quite as much this year, but it rained enough that we were pretty wet by the time we got down there. And, of course, not one drop of rain during the Old Howard in what turned out to be another beautiful day. We took Shades Crest all the way to Shelby Co 1 over to Grey Hill Rd (Shelby Co 13) all the way to Greenpond and Woodstock. At Woodstock, we jumped on AL-5 which I mistakenly called I-5 (a California interstate). I’m pretty sure that AL-5 is the most dangerous road you can ride a bike on in Alabama. It is a strategic highway that connects two chunks of Alabama that have no interstate between them. Furthermore, at the north end is the huge Mercedes plant and the south end is Mobile, Alabama – a major shipping port. So this road is essentially a two-lane interstate (one lane each way) with no shoulder in many places. Even at 4:30 in the morning, there are large trucks and more than just a few cars. So it is definitely a highway you want to avoid as much as possible. But that also leads to a problem in that there are very few alternative roads going in the same direction. So that means going way out of the way or taking dirt roads. Fortunately, the dirt roads are AWESOME! We ended up on three different dirt roads on the way down to Marion. We hit the first dirt road about an hour before dawn so it was pretty dark. A guy in a pickup truck rolled up on us at the beginning and said he thought he was the only one who ever rode around there. He said he had a hybrid bike he rides. We flew down the dirt road and connected into Haysop Rd a mile later. I recognized the intersection because it is at the fork in the road where if you stay to the right it looks like you are riding through someone’s backyard. We came in from what I guess is actually the main dirt road, but was new to me this year. 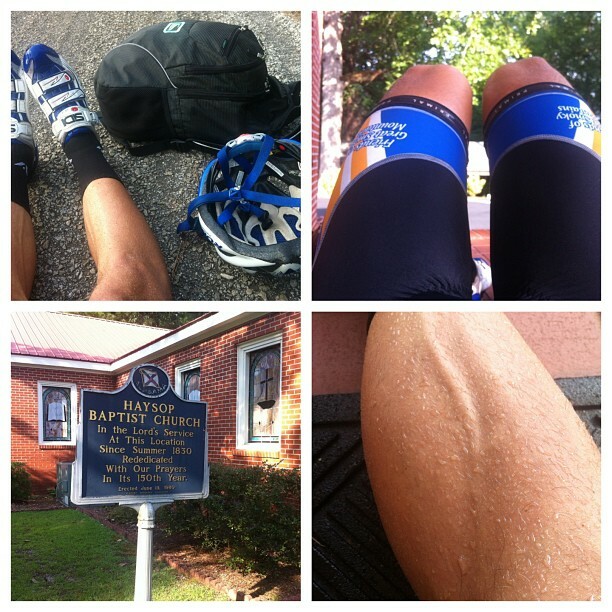 I knew the rest of Haysop Church Rd because it was the dirt road I took back on the second day of my ride back home to Birmingham from Natchez, Mississippi after the Nashville to Natchez fundraising ride in 2013 (coming from the opposite direction). From the opposite direction, the road starts out paved with a tough climb. When I rode through there in 2013, I was nearly out of water and on the edge of heat exhaustion having ridden over 800 miles by that point in a very hot summer in Tennessee, Alabama, Mississippi, Louisiana, Mississippi again, and Alabama again. That’s where I snapped the pictures in the collage above. All these adventures start to run together “every mile a memory”. So I’m thinking of how different it was on that day as opposed to the dark, cold, light rain of our current ride down to Marion in the reverse direction. The second dirt road was quite a bit later – Co Rd 17 – as I was trying to route down to 9 mile dirt rd. These roads were all new to me so when we turned onto Co Rd 17, I mistakenly thought we were already down to 9 mile dirt rd. It looked vaguely familiar as many of the dirt roads in the area look like logging roads. I snagged this video as we climbed up to a clearing similar to the clearing we would encounter later on 9 mile dirt rd. This dirt road ended much shorter than I expected, which confused me. A few miles later, though, we made it to the turn onto 9 mile dirt rd, which is a bit misnamed as only the first few miles are dirt. The rest is paved and takes you straight into Marion, the start of the Old Howard. Spanish moss on live oaks in the Selma cemetery. I still find it amazing that out of all the universities in the world, I would find an awesome position at a university kicking off one of the top century rides in the southeast the very semester that I start teaching! That university, of course, is Samford University, and the century is the Old Howard which started in April 2005. Kristine and I had just moved back to Alabama with our 6 month old daughter from California in January 2005 so I could start teaching in the spring semester. I rode the Old Howard in 2005 and 2006 before it started to conflict with my racing schedule as it was the same weekend as the Mississippi Gran Prix. Eventually, though, the Mississippi Gran Prix changed weekends and I was able to start riding the Old Howard again in 2015 and 2016. This entry was posted in Adventure, Racing, Training on April 25, 2016 by kartoone.